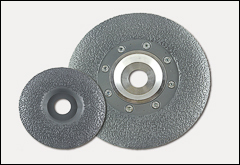 Sanding discs, abrasive discs, steel-backed discs, carbide grit sanding discs, diamond coated sanding discs. 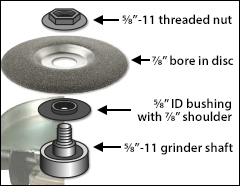 Additional abrasive discs are shown our Discs page. Please see our complete line of other Cutting, shaping, grinding tools . SAFETY WARNING: Make sure the maximum RPM of the disc you choose below, is more than the RPM of the power tool you are using. Also make sure the maximum RPM of the backing pad you are using, is more than the RPM of your power tool. These sanding discs have a nearly flat shape with just a slight curvature for most effective use of the coated area. They have a smooth cutting action and are easy to control. All sanding discs feature a 7/8" bore and are intended to mount on a 5/8" shaft: an adapter is required. Grind, shape, cut, or sand fiberglass, composites, plastics, rubber, and polyurethane. Not prone to loading, but may easily be cleaned with solvent or burned clean with a gas torch; the heat won't harm the teeth. Recommended speed range: 5,000 - 15,000 RPM. These tools remove material very rapidly, yet leave a relatively fine surface on the work. Extremely sharp tungsten carbide teeth last 7 to 10 times longer than high-speed steel tools. Brazed diamond coated discs that are compatible with most standard grinders. Discs have a 7/8" bore: an adapter is required. Very aggressive grit. Curved shape for easier material removal. Discs listed above have a 7/8" center hole. They are designed to mount on a standard angle grinder with a 5/8" shaft. Discs mount on the 7/8" shoulder found on the shouldered bushing or adapter included with most angle grinders. If your grinder does not have one of these bushings, you may obtain one from that manufacturer's parts list. The shouldered bushing is put on the grinder first, followed by the disc, and then the disc nut. See our Mounting guide PDF for more information and an enlarged view.